It’s post-New Year’s. My Christmas tree is gone (although I keep finding needles in weird places–how did that get in my bra?! ), the ornaments are packed away, and the lights are down. But, I’m still experiencing a major holiday hangover. After holiday travel, the flu, a Lyme flare, and a couple of stress-inspired poor eating decisions (I’m looking at YOU entire gluten-free pizza with enough cheese to choke a horse), my body is BEGGING me to get back on track. So, I’m listening to my body’s plea and responding with my favorite detoxing green juice, salad, soup, and lots of episodes of Friends on Netflix. It does a body good. This is day three of drinking my detox juice in addition to watching my diet (i.e. NOT eating entire gluten-free-cheese-monster pizzas) and I’m starting to feel better. I woke up this morning with a little spring in my step and the desire to go on a little walk around the neighborhood. A couple of days ago you couldn’t have paid me to get off the couch. I was deliriously tired and doubled over in pain. Not my favorite. It’s really hard to feel like you’re starting 2015 with a bang when you’ve been wearing the same sweatpants for (almost) the ENTIRE YEAR. It’s no secret that this isn’t a fashion blog (you’re welcome). But, today I’m feeling pretty darn good. I’m not saying that this juice was the only thing that contributed to feeling better, but it sure as heck didn’t hurt. Lemon— Hello, vitamin C! This little yellow powerhouse works hard to cleanse your body and boost your immune system. It works to keep your body alkaline, cleanses your liver and even has antibacterial agents which help to keep your digestion on point. Often when I’m feeling crummy you’ll see me putting lemons in my water to assist in detoxification–it’s one of the easiest and most effective detoxing methods I’ve found. Ginger— Is your tummy upset? Fear not. Ginger to the rescue! It helps decrease inflammation, aids in digestion and can even act as a pain killer. I seriously love this little root. It’s my go-to remedy for nausea and other digestive woes! Cucumber & Celery — I love juicing these veggies due to their high water content. It produces a lot of bang for your juicing buck. But, they’re not just in there for show. They actually have a lot of great health benefits. Cucumbers are extremely cooling to your system and help to aid in inflammation. Celery is also cooling to your body and is jam-packed with electrolytes, magnesium and other essential minerals. I rarely make a juice without these two ingredients. Romaine Lettuce— This veggie is another one that I love to throw in the juicer since it produces a good amount of juice! However, it also packs a nutritional punch. It’s relatively high in chlorophyll which helps with cell repair and regeneration. Essentially, the quicker you repair your cells, the quicker you will stop feeling crappy (science-y, I know). It’s also a surprisingly good source of vitamins, A, C, K, B vitamins and folate. Cilantro –Like I said in the above paragraph, this herb is not messing around! Not only is it anti-microbial, anti-inflamatory, and immune-boosting but it’s also very effective at binding up heavy metals and toxins that are wreaking havoc on your system. Green Apple –I like this variety of apple since it’s relatively low in sugar and provides a hint of sweetness without a blood sugar spike. It also contains pectin which helps to keep your intestines in good health by flushing out toxins. 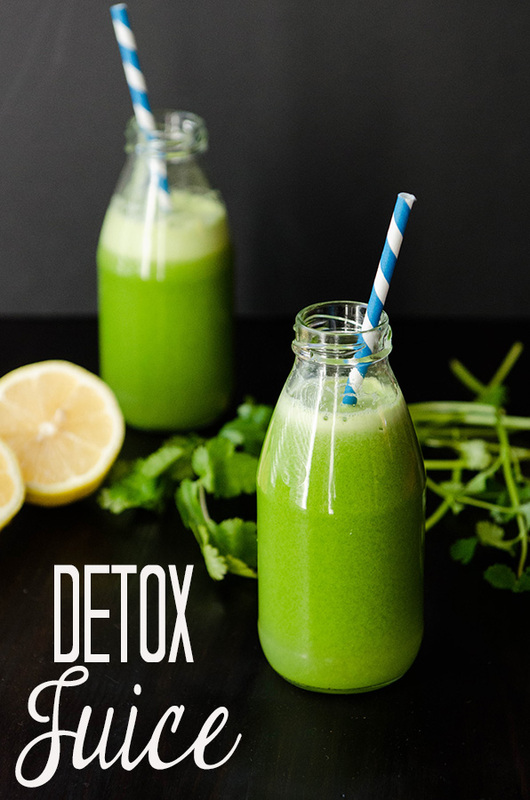 So, there’s just a little bit of info about each veggie– I’m sure I’m only scratching the surface, but it makes sense as to why this tonic aids in detox so fabulously! I hope you have as much success with it as I have. Who knows, maybe after I guzzle up the rest of my juice (yes, I’m drinking some right now), I might find it in me to change these sweatpants. Look out, 2015! I’m coming for you. Need some more JUICE-SPIRATION?! I’ve got you! 1-2 inches of ginger root, depending on how spicy you like it! Process all of the ingredients in your juicer according to the instructions. Drink immediately, or save for up to 48 hours in an airtight container. Note: I am not a medical professional. All opinions expressed here are based solely on my own experiences and research and are not intended to diagnose, advise or treat anyone. If you expect you are suffering from a medical condition, please seek the proper attention from a medical professional. Thank you! I will be making this one tonight!!! Cilantro… great idea, and I like the extra bit of info on each ingredient! Thanks for that! We JUST finished re-watching Friends, and it took an entire year as Netflix was often back ordered on a specific disc and NOW they decide to stream it?!?!? When I saw that was going to happen I rolled my eyes so hard I saw my brain. So, you think this would work as a smoothie in a vitamix if you dog have a juicer (or if you do and it’s hidden deep in a closet bc you have no idea how to clean it properly)? 2. What’s with the Christmas tree needles getting EVERYWHERE?? We recycled our tree at least 3-4 days ago and I vacuumed everything in sight but I’m still finding needles. Oh, Brittany. I hear you on the juicer clean up. Ugh. Every time I juice I’m like… I did this to myself. 😉 As far as the needles, who knows. It’s like spilling glitter everywhere. This looks so wonderful and healthy Gina – yum! 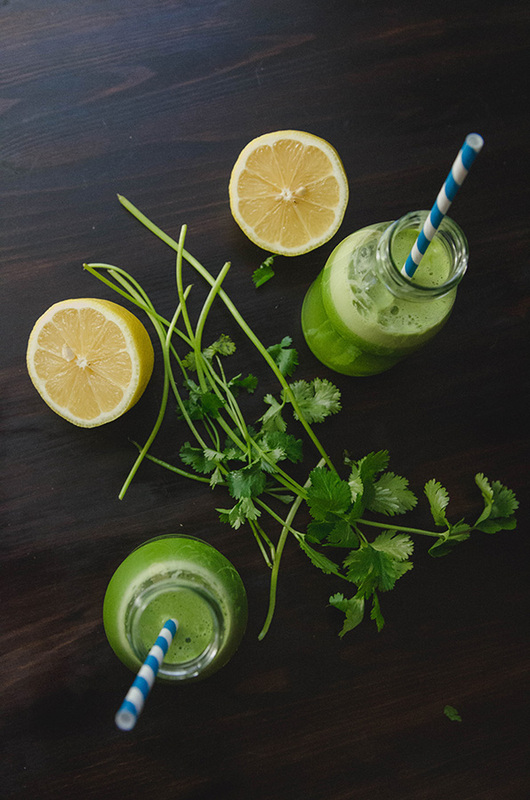 Great blog post, and the juice sounds awesome — it’s very similar to my standard green juice except for the cilantro, but I happen to have cilantro that needs to be used so I’ll be making this tonight. Dana: I use a Vitamix too, and about half the time I strain out the solids to make juice rather than a smoothie. Works great. How much of this do I drink per day. It is very tolorable, I had my first 8 oz glsss this morning. 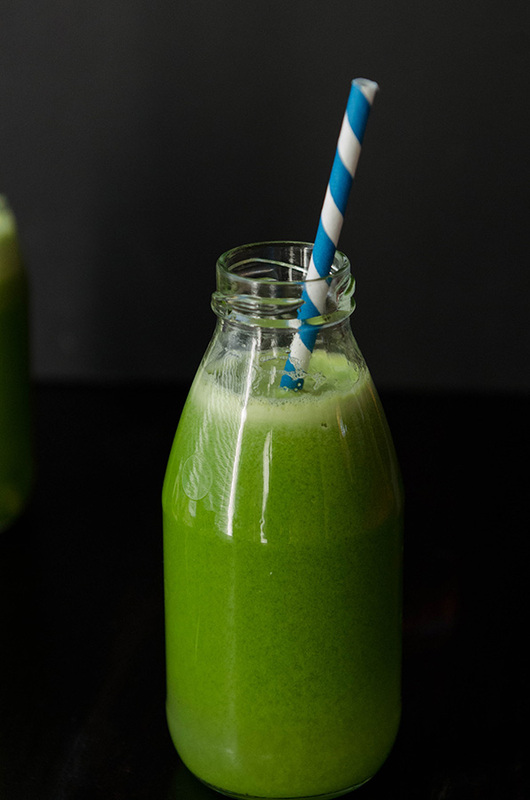 I love juice but I hate cleaning the juicer, but I will try this recipes! Can romaine lettuce be replaced with spinach? Do I just throw ingredients in blender and press go all do I have to steam first. How many cups a day should we drink. The recipe makes 6 cups.